BanyanBotanicals.com website, is my favorite, and one of the best sources for ayurvedic supplements available in the United States. It is a great source for supplements, information, and deepening your understanding of Ayurveda. The following information is from their site. Enjoy! Kitchari is a unique because it falls under both the neutral and medicinal categories. It not only provides nourishment for the body, but, due to its spice combination, also benefits digestion. This makes kitchari an ideal food of choice during times of stress on the body, such as during an illness, periods of overwork or change of seasons. It is also an especially good food to use while on a mono-diet as part of an internal cleansing regime. There are several variations to a basic kitchari recipe and the one below is basic, easy to start with, and balancing to all three doshas (vata, pitta and kapha). You will find that the ingredients are readily available at most health food stores, including New Seasons, my favorite locally owned and operated whole foods market. ½ cup split yellow mung dal, rinsed well, soaked overnight and drained. (It is best to use mung dal with the hulls still on if you tend toward constipation)---you can also use green mung beans, whole or split. In a heavy-bottomed pot, heat the ghee on medium heat. Ghee burns easily, so be careful. Sauté the mustard seeds and cumin seeds in the ghee until the seeds pop. Then add the drained mung dal, asafoetida powder, turmeric and salt. Stir until the mix almost starts to stick to the bottom of the pan. Then add the rice, water, cumin powder, coriander powder and ginger. Stir well, making sure nothing is sticking to the bottom of the pressure cooker or pot. Cover and bring it to a boil on high heat. Then turn the heat down and let it simmer until both the rice and dahl are mushy. 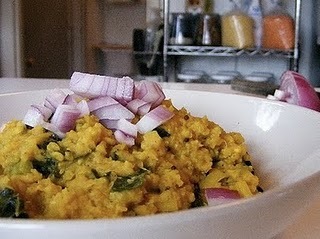 Enjoy the benefits of hitting your "Body Reset Button" with kitchari.